WPD's Policy Team has invested in five infrared cameras which can help identify sulphur hexafluoride (SF6) gas leaks in operational switchgear and help WPD achieve its ED1 target of a 17% reduction in its SF6 leak rate. SF6 is a potent greenhouse gas used throughout the industry as an insulating medium in switchgear with no viable alternatives available at present. With one kilogram of SF6 being the equivalent to almost 23,000kg of carbon dioxide, finding a solution too to reduce leaks has environmental benefits as well as being good business sense. Geoff Budd, Policy Engineer from Bristol, has been trialling the FLIR infrared camera. "We have been using the camera for more than a year now to pinpoint leaks and check them again after repair and we are really pleased with the results," he said. "We took a range of options to address SF6 leaks to one of our Stakeholder events earlier this year and received significant support for the purchase and deployment of the cameras." Since then WPD has purchased a camera for each licence area and issued them to nominated Projects team members. Training has also taken place for more than 20 members of staff to maximise the benefit of this significant investment. SF6 is odourless, colourless, non-toxic, and non-flammable which makes it difficult to detect with the naked eye. The cameras are able to 'see' SF6 leaks in real time from switchgear while energised so repairs can be planned at the next outage. "The FLIR GF306 Optical Gas Imaging (OGI) camera for SF6 gas visualisation is a very specialist camera. 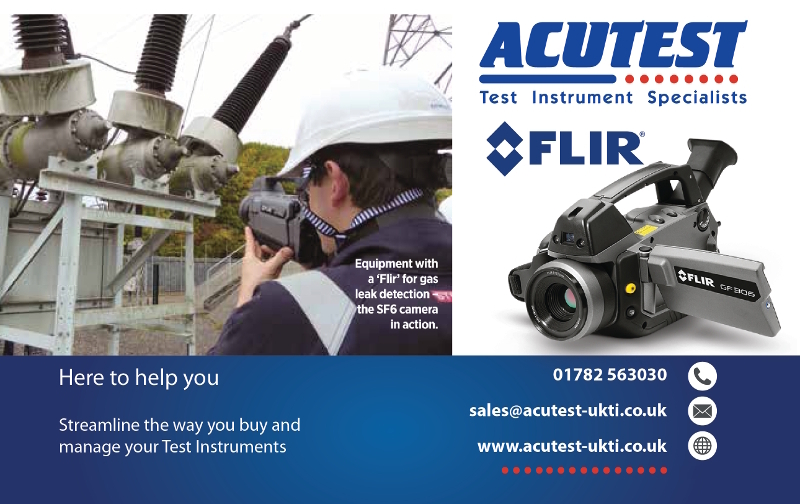 Unlike traditional hand-held thermal infrared cameras, the FLIR GF306 utilises cooled detector technology. The ‘ultra’ sensitivity and the very specific spectral tuning of the detector material to the absorption characteristics of SF6 within the infrared spectrum, is key to the cameras ability to visualise even the smallest of SF6 Leaks (below alarm threshold). The combination of performance and ergonomic design of the FLIR GF306 was evident to WPD following trials, supported by a FLIR OGI expert and supporting partner Acutest. The key thing that facilitated successful deployment was user training, provided by a FLIR expert".